These mines, differing only in dimensions, were produced in World War II, but were never used. Both are bounding chemical mines which are capable of spreading chemical agents over an area of 250 to 300 sq m.; (300 to 360 sq. yds;). The KhF-1 and KhF-2 are electrically detonated by a concealed observer at a distance of 200 to 300m. 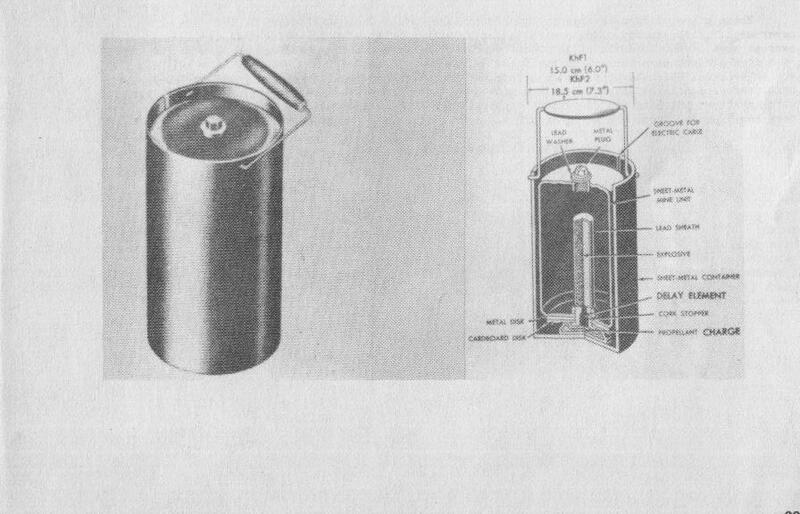 Firing of the electrical detonator ignites the propellant, which hurls the mine out of the container and simultaneously ignites the delay fuze. After a delay of approximately 1.5seconds, the delay fuze sets off the explosive charge, which shatters the mine and disperses the chemical agent. When disarming these mines a protective mask and clothing should be worm. Length: 345mm , diameter: 150mm. Weight: 15kilo including 4.5liter chemical content, 10gram toluol or melinite and a blackpowder propellant.